Beginning a fitness program shortly after delivering a baby can be intimidating and challenging. However, postpartum workouts will help to shed pregnancy weight, relieve stress, and help a woman bounce back to her pre-pregnancy fitness level quickly after labor and delivery. 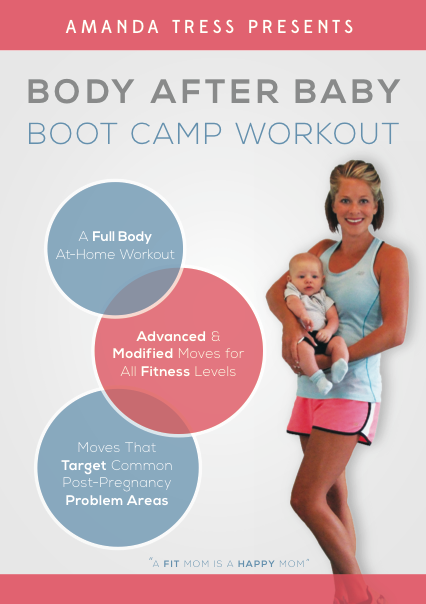 This Body After Baby Boot Camp Workout DVD is perfect for women who are hoping to get their pre-baby body back and do a fabulous workout in the comfort and convenience of their own home. Follow along as Cole, my 11 week old baby boy, and me, demonstrate the modified moves for those who are just starting a workout program postpartum. You can also follow my husband, Brandon, as he displays the advanced moves for husbands or those who are in fabulous shape. Amanda Tress is a personal trainer specializing in prenatal and postnatal fitness. She maintained two fit pregnancies and bounced back very quickly after each. For a limited time, I am offering a package option for my Pregnancy Exercises: Fit Pregnancy Total Body Workout DVD and my Body After Baby Boot Camp Workout DVD for the very low price of $24.99. Click here or on the DVD cover image below for more information. Find a theme that doesn’t have a lot of clutter as this will distract people away from your content. Some of the best blog sites have been successful by concentrating on more narrow topic parameters but the approach suggested here tends to throw the doors wide open. Hi! Hiit is the best way to shred your body after having a baby. I love this workouts. want to learn more about eating clean. love it! I’m 35 weeks today so I’m getting ready for the last stretch! about interval training before, but MAX interval training is most likely new to you. to six for the moderate pace, and 7-10 for the challenging pace. me more or less equivalence just about the worst discipline? It would be with child if you rump. Regards.